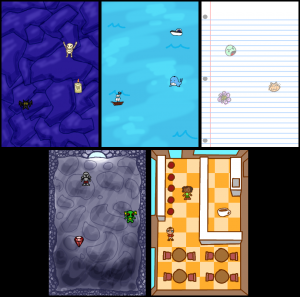 For this lesson, let’s start making a playable game! It will start out simple, but we will add more features over the next few lessons. This is how you write games, anyway! One step at a time! For this version of the game, we’re going to have a background, and a “treasure” item. The treasure is placed randomly on the screen. The goal is to tap the treasure to gain points. If the player is too slow, the treasure will move to a new location after a few seconds. Go ahead and create the project in Gideros. From the “Sample Graphics” folder, add the following files. I would suggest creating a “content” folder within your project directory, to keep things clean. 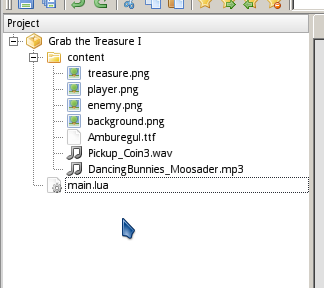 Under the Sample Files folder, there is a folder named Grab the Treasure sets. There are several folders with different themes, which includes a background.png, enemy.png, player.png, and treasure.png. Choose a set and add it to your project folder. A “success” sound effect from the Sound folder. A background song from the Music folder. Add a font as well. First, let’s just load all of our assets, draw everything to the screen, and play our background music. To load in our images, we need to create Texture objects, which load a file name. Then, we can create Bitmap objects that will be displayed in the game. As a shortcut, you can load the texture at the same time when you are loading your Bitmap. This is handy if you’re only going to use an image once, like for the background. For sounds, you just create a new Sound object, and load in a sound file. For text, we need to create a TTFont object, and load in a font file and the font size we will be using. 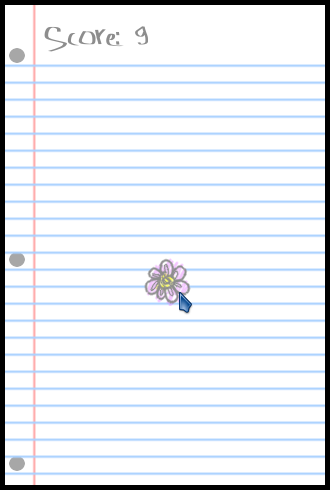 Then we can create a TextField object that actually stores the text that we’re going to draw. A new TextField needs the Font and it needs the text that will be displayed (which can be updated later). Remember that the stage is how we can draw our images out to the screen. To draw Bitmap and TextField objects, we simply use the addChild function from the stage object. Now when you run the program, our images and text should be showing, and the music should be playing. Try it now. When the player touches the screen, we want to see whether they’ve touched the treasure. If they’ve grabbed the treasure, we are going to add to their score, and move the treasure somewhere else. stage can also be used to detect input using the event listener functionality. We will need to write the HandleClick function now, otherwise our program will have an error when you try to run it. Inside HandleClick, we will want to test to see whether the treasure was touched. To do this, we call the hitTestPoint function. hitTestPoint is a function that belongs to all Bitmap objects, and it needs an x and y coordinate. In this case, event.x and event.y will give us the coordinates of where the mouse clicked (or finger tapped). Also remember that our HandleClick function needs to go ABOVE our stage:addEventListener function that is using the same function. Play a happy sound effect. Put the treasure somewhere else. but for changing the score, we’re going to first need a score variable! At the beginning of the program, let’s make a score variable, and set it to 0. -- like when we're loading our assets. Then we can update the TextField‘s text with the :setText function. We can write the text string “Score: “, and to insert a variable afterwards, we need to use two periods .. in order to concatenate the score onto the label. -- Change the X and Y coordinate of the treasure. If you run the game at this point, we will be able to rack up a score easily because the treasure won’t move, but the sound and the score counter should work fine. Make sure to test before we move on! It’s much easier to fix bugs when you test frequently, than if you try testing after you’ve written a lot of code. OK, so what does RandomlyPlaceTreasure need to do? Randomly generate an X coordinate. Randomly generate a Y coordinate. Set the treasure Bitmap’s position to that X and Y coordinate. 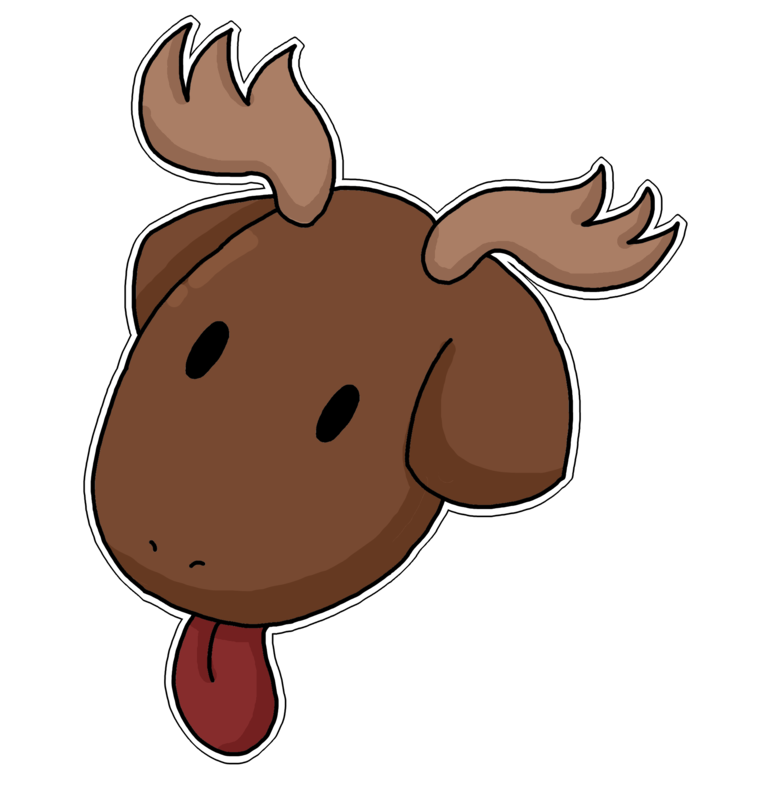 The Lua scripting language has a math library, which we can use to easily do math, like trigonometry, or getting a square root, but for now we’re only interested in the random function. With the math.random, we can generate a random number between the minimum and maximum value, which we will pass in when we call it. Our app should be running at a resolution of 320×480. First, note that using local before our variable name is another way to declare a variable – if we use local from inside of a function, this variable is only meant to be used from within the function, and cannot be used from elseware in the program. Since it’s a temporary variable, let’s use local. Finally, when we start the game, we should call this function so the treasure starts at a random position. Otherwise, the treasure will always start in the same location. Add a call to RandomlyPlaceTreasure at the very bottom of our code file, after all our functions have been created, and after the stage:addEventListener functions. Test out the game now. When it begins, it should have the treasure in a random location. When you tap the treasure, it should move to a new location, and your score should go up. It runs OK, but this isn’t very game-y. After all, where’s the challenge? As a final feature for this chapter, let’s add a timer. If you’re too slow to grab the treasure, it will move to a new location. Currently, our game only updates if the player taps the screen. We can use another event listener to update the game periodically, so the game will keep running even if the user isn’t tapping the screen. We can do this uUsing the Event.ENTER_FRAME event. Then, inside of an Update function that we have to write ourselves, we can figure out what we want the game to do every frame. -- If counter is 0, move the treasure. Subtract 1 from the moveTreasureCounter variable. Check whether moveTreasureCounter is now equal to 0. If it is, call RandomlyPlaceTreasure. Otherwise, we won’t do anything else! In the past, we’ve assigned variables with something like moveTreasureCounter = 100. This is just another way to set the variable – we’re setting it to the same variable, but less by 1. So, to check whether two numbers (or two text strings) are equal, we use two equal-signs: = =. If moveTreasureCounter == 0, then we’re going to move our treasure. I’m setting moveTreasureCounter to a random amount of time, between 50 and 200 frames. You can hard code this if you would like, or change the minimum and maximum values. Now, the first version of our game should be good to go. Run it, check whether the treasure is moved to a new location after a certain period of time, and that you can still tap the treasure to gain score. All good? If you want to further customize your game, you might try some of these changes. If you miss tapping on a treasure before the timer runs down, remove one point from the player’s score. If the player’s score becomes less than 0, then display a “game over” message, and use stage:removeChild to remove our treasure Bitmap.